Loved this insulated bag. Needed them for my most recent trade show. Thanks a lot CEP. The logo on this bag that you customized for is impeccable. Thank you so much for the beautiful bags for my business and myself too! Bough these insulated bags for work. My boss is very happy with the product and says he will be placing another order soon! Super durable insulted reusable cooler. Love this product so much. Brought it to me last trade show and they sold like a charm. Thanks. Awesome bag! Will purchase again! Thanks CEP! These bags were perfect! They were a great marketing tool for my company!! Thank you CEP! These bags keep my food fresh all day long! Plus our logo looks amazing! We love our bags! They are perfect! This is the perfect bag for our most recent marketing efforts. Our logo has high visibility and looks professional. These bags are attractive and practical! Our customers use them all the time! Cute bag considering that it is at wholesale and you can receive them in a quick turnaround. I love working with the custom earth team. I just ordered a ton of cooler bags for my upcoming party, looking forward to our next project!! Such a great promotional product for our business! We have gained so much exposure thanks to these bags. Such a great promotional product! My business has gotten so much exposure thanks to these bags! Good size bag, it worked well for our event. We used this as a hand out to all attendees at our outdoor music festival. We put two complimentary bottles of water inside because we anticipated the weather to be very hot which it was. The music festival logo looked great on the bag. I will be reordering this bag for our event next year for sure. These bags are the perfect size! Easy to carry and visually appealing. I love the business card holder on these bags! Great for marketing! Well made at a good price. I suggest this cooler bag, it is not too big and not too small. This bag is very strong and you can clean it, I suggest this to any grocery store. This cooler bag was a great buy for my business, they get used all the time and it promotes my brand everywhere they go. These bags are so high quality! They work great and our clients use them often. LOVE, GREAT REUSABLE BAG AND ITS MADE OF ENVIRONMENTALLY FRIENDLY RECYCLED MATERIALS!!!! I am in the marketing and branding department for a large hotel corporation. We used this bag to give to all our guests, it has been great and we have received several repeat business off of this bag. My city switched to using reusable bags for most of the shopping through out the city. So I had to follow suit for my business I purchased this bag and the PP7 bag from custom earth promos as our standard shopping bags. The feedback has been great and most of the customers love them. We gave this bag out at our industries national trade show. I purchased it mainly for the business card holder slot, I wanted to have a spot that our potential customers can see all of our contact info and easily contact us for some of the products and services we offer. Besides that small but big design fact about the bag the rest of the bag is made well, the overall logo print looks good and the handles are stitched on strongly. I recommend this bag for a hand out with your business card. Love the side pockets, we used this as another opportunity to promote our company and to promote sustainable living. We put stainless steel reusable water bottles with our organization's logo on it (we also got this from CEP). Overall the bag and the water bottles looked great. Awesome bag to use for a fundraiser. We placed tons of little giveaways in this bag and had our business card and company logo on display. Big fan of this bag works well as a promotional giveaway. Perfect bag for a conference to hand out, has a place for your business card and 2 side pockets. All of our employees/partners loved it. Great for trade shows or other promotional events. This bag was a huge success for us. Custom Reusable Cooler Bags from Custom Earth Promos are some of our highest-selling promotional giveaway items. Your customers will love the stylish and practical design of our bags. Emerging companies and start-up businesses can distribute our bags at trade shows, conventions, and marketing events to spread customer awareness and strengthen brand identity. You can customize these reusable cooler bags with eye-catching imprints of your brand name and logo, along with creative messages and slogans. Paired with your choice of color, our high-quality imprints are sure to get you noticed wherever these bags go. 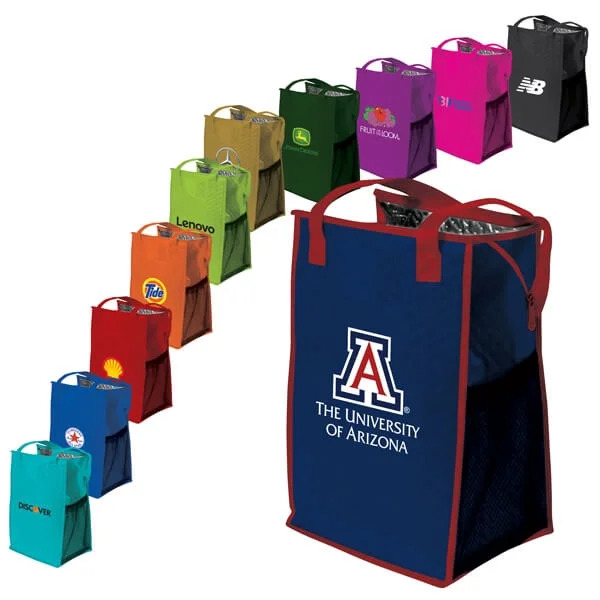 Customize these bags to promote a number of businesses like hotels, spas, department stores, restaurants, and so much more! Custom Earth Promos brings you the trendy Custom Reusable Cooler Bag, which provides your business with stylish, practical exposure with every use. They are made from high-quality, non-woven polypropylene that offers durability for long-term use. Each bag comes with insulated lining to ensure that food and beverages will maintain the right temperature for hours at a time. Your customers will definitely find these bags ideal for picnics and other outdoor events. Our Custom Reusable Cooler Bags come with zippered closures to protect contents from falling out, as well as seal contents for additional freshness. The bags also come with two more bottle holders inside, so beverages can be neatly organized for even more space! The plastic bottom inserts in the bags provide additional support for carrying heavy items. With the 20" long carry handles, the bags can be carried comfortably and effortlessly. All our products are tested for contamination from harmful additives that come under the California Proposition 65 guidelines. Our overseas factory specializes in producing a large quantity of high-quality items in just a few weeks. Since we supply custom reusable bags directly from the factory, you will find that our prices are highly affordable, and offered at the best wholesale prices. You can now choose from 11 vibrant colors for the bags: Lime, Teal, Khaki, Grape, Hunter Green, Black, Red, Brite Pink, Orange, Royal Blue & Navy Blue. The imprints can be customized with your brand name and logo, along with custom messages and creative designs. You have the option to select from an extensive range of pre-designed graphics and stock images. With just a little extra time, we can guarantee your product will look stunning!